We “practice” yoga, we “practice” meditation. Plein air painting is “practiced”. Like yoga, and like meditation, plein air painting is performed, hopefully, with increasing awareness and perhaps with increasing skill, but I don’t know of any painter who thinks their practice is “perfected”. Even though a plein air painter might occasionally paint the best painting of her or his life, the next painting still begins with the proverbial blank canvas. I paint weekly with the Emerald Coast Plein Air Painters. Actually, I coordinate the weekly sessions, sending out the location to the email list of 240 people, and meeting the group of 2 to 15 painters who might show up. We paint for 3 hours, and then have a soft critique, followed by lunch at a local restaurant. The social aspect of the weekly get-togethers reinforces my practice. In January, it was foggy for one of our sessions, at Turkey Creek in Niceville, FL. By the time we finished, the fog had lifted and colors had appeared, but initially my scene appeared to be monochromatic. I used a different approach for this foggy scene. Normally when painting en plein air, the darks are laid in first. But to create the atmosphere of light through the fog in this painting, I painted the light brownish-gray sky and water and the very light value background shapes, layering the darker, closer shapes on top. The last week of January we painted at Henderson Beach State Park in Destin, Florida. The Florida Panhandle coast from Panama City to Pensacola is covered with sugar-white, fine quartz sand from thousands of years of erosion carried down to the Gulf of Mexico by the Apalachicola River. The white sand picks up reflected color from everything around it, and sometimes the compliments of those colors are sensed by the viewer. The sand might appear pink next to the green foliage topping a dune, or warmer and yellower near cool shadows. The next week we painted at Camp Helen State Park, which is on the Walton County / Bay County border. The park contains hardwood live oak and pine hammocks, marsh ecosystems, and sandy beach. I hiked out to a view of the dunes, where I could just make out the skeleton of the old pier. I was challenged by the puffy little clouds covering most of the sky, with a little blue peaking out just here and there. The first weekend of February, I drove two hours east to the village of Apalachicola to meet up with my friend Lynn Wilson, owner of On the Waterfront Gallery and President of the Artists of Apalachicola Area. Lyn is sponsoring monthly Weekend Warrior painting workshops, and this weekend was the first, taught by Atlanta artist Debra Nadelhoffer. I took the workshop both to learn and also to observe the logistics, since Lynn has invited me to teach the workshop in May. Debra likes to paint the sky with different colors of the same value in order to impart the shimmer or movement of the air that she sees. I painted the above painting, and later was painting on a new canvas, trying to learn how to paint the blinding glimmer of sunlight on water, when passers-by stopped and asked to purchase the above painting. The following paintings were also painted in the Nadelhoffer workshop, as I tried new color combinations, and exaggerations of color. After returning home, I painted with the Emerald Coast Plein Air Painters, and found myself experimenting with color temperatures in order to enhance the feeling of space and mood. I did not finish the painting (below) and did not keep it, satisfied with what I learned in the process. All of these paintings are available for purchase. Contact me for information, using the form that comes up when you click on the painting. As if I didn’t already have enough challenge painting en plein air, I recently tried out a new color, “cobalt green” on a couple of plein air outings. In both cases, the bright color was perfect for representing what I was seeing at the time, but it challenged me because I was unfamiliar with how it mixed with my other colors. At the Ft. Walton Beach Indian Temple Mound, I painted a bushy palm study, and at Grayton Beach State Park I painted a front-lit scene showing the colors to be much warmer and brighter than when viewed from my usual position of looking into the light. The next week our Wednesday painting group, the Emerald Coast Plein Air Painters, met at the restored train depot in DeFuniak Springs, and we each painted various views around the depot and the surrounding lake yard. I chose a limited palette which included cobalt violet, a color I have carried in my paint-kit for a long time, but rarely use. It mixed well to create many of the red-violets I used to tie my painting together. This past weekend I took a workshop from Keith Martin Johns hosted by my friend Lynn Wilson through her On the Waterfront Gallery in Apalachicola, FL. Keith taught us to paint using a 9-step value-scale from white to black for our method of changing the value of our colors. I never use my ivory black. It was a bit stiff when I squeezed it out of the tube, and I realized the tube may have been as much as 30 years old! Keith and Linda had provided us with photo references, and the assignment was to take two photos with two very different kinds of lighting, one predominantly sky, and the other a landscape, and compose a 24 x 36 painting from the two photos. I felt uncomfortable with the unfamiliar methodology, so it really forced me to stretch and grow, trying something new, with a sky I never would have attempted except for having attended this workshop! My effort is below. These below are the two photo references the instructor provided that I used to create the composition above. I often say that I meet myself coming and going, when I am plein air painting. By that I mean that I have to do a lot of work on self-acceptance throughout the process of making a painting. Every painting is a struggle – none go exactly as planned. Some paintings go better than others, but some seem like every stroke, every color, every value, every shape, is wrong and needs to be corrected. Those paintings require self-forgiveness and self-acceptance all the way through, or else I would quit and they would end up in the trash. If I don’t forgive myself, then I become angry, and then painting is no fun. I have to reach the “zen” of the process, that point where I start to let be whatever mark I make, without conscious judgement of “good” or “bad”. The artistic analysis and corrections become unconscious, and that is when painting becomes meditative and personally transcending. I recently have done a number of paintings, some with the local Emerald Coast Plein Air Painters, and some at an event in Apalachicola, the Forgotten Coast En Plein Air. Yesterday I did not complete my painting. I often wait until last to develop the focal area of my painting. Yesterday I worked on the focal area first, and I lost track of the time, so the call for group critique came while I still had half the canvas bare. I quickly slapped in the greenery and a suggestion of the ground to give some context and the following image of the Bruce Cafe was the result. 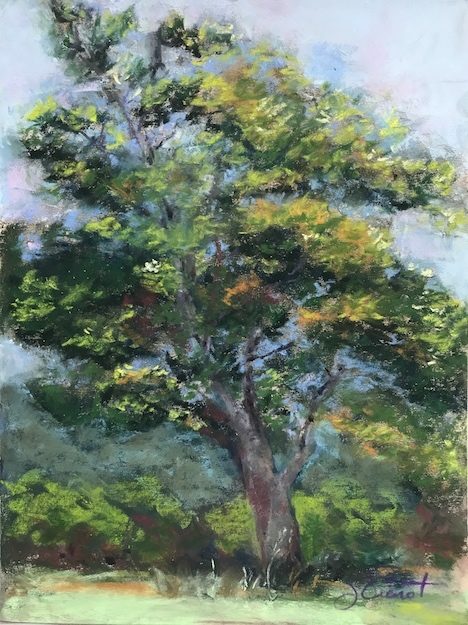 Last week’s regular plein air session was at Oak Marina in Niceville, Florida, yielding my impression of the graphic light on the foreground and the massive oak tree trunk. I painted 3 paintings during the span of the Forgotten Coast En Plein Air. I painted in the Quickdraw Competition the first weekend and was pleased that my painting sold during the judging! The scene included a row of potted plants in front of a landscapers office, some in the shade, and some in the sun. I called it “Garden Ready”. The next day my eye was caught by the light on the crumbling stucco wall and corrugated tin covering the windows of the abandoned waterfront Joe Taranto Seafood Company building. Across the street is the iconic wall of buoys, but I just suggested the buoys in order to keep attention of the texture of the wall and tin. I could not stay for the entire event — my pool service business is experiencing a growth spurt, so I needed to be home during the week, but I returned on the weekend for the final showing of the works of the professional invited artists. While there, I painted what was told to me was the oldest structure in town, a building which now is just four walls, with no roof, draped with trumpet vines. The stark shadows of the palms on the wall were what initially attracted me to the scene. Unfortunately, I made a lot of what we painters refer to as mud when I was painting the spaces between the shadows, so I came back to the scene the next morning and cleaned them up. This is my result. The week before last, our local plein air group painted at Four Mile Landing in Freeport, FL. I chose the industrial scene of the port, where barges were ready to be loaded, and on one bank, a new fireboat’s water cannons were being tested. The light alternated between a sunny glare and muted overcast as the atmosphere wafted in and out. The result was more impressionistic, with extra emphasis on the lights and darks. All of my paintings are available for sale — click on the painting for an individual view showing the price, with a form to contact me. In addition to “Garden Ready”, the Quickdraw competition painting shown above, the following paintings also recently sold. 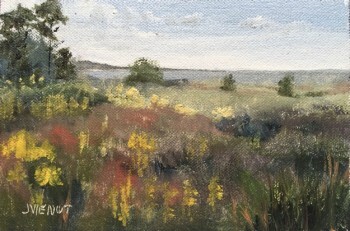 “Marsh at Indian Pass” sold during the Artists of Apalachicola Area member show two weekends ago, and “Island Plantation” sold this past Monday night at a meeting of the local women artists network.